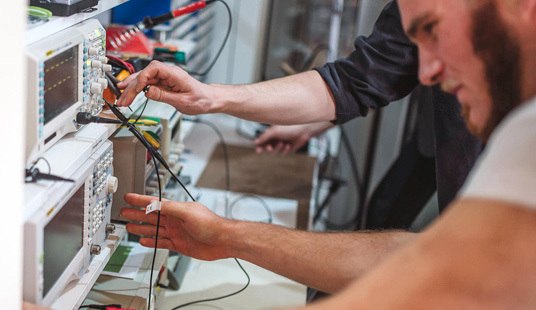 Our passion is electronics and building physical products, so if you are looking for a design service that is dependable and performed by engineers who enjoy doing the work, you came to the right place. We offer to our clients a complete electronics design service, from idea and concept to fully functional final product that is ready for manufacturing. Over the years we enjoyed designing and testing many different electronic circuits. That gave us the chance to gain deep expertise, identify the right electronic circuits and convert them into reusable building blocks. Here are some examples of the building blocks that we are able to implement quickly and accelerate your product development: memory, battery chargers, power supply, communication circuits, Bluetooth connectivity, Wi-Fi, XBee, ZigBee, GSM, LCD/TFT/LED displays, inputs/outputs, environmental sensors, etc. Our in-house testing will speed-up regulatory compliance of your product by doing pre-compliance tests during the design stage. Standards and regulation are always a concern when launching a new product. For electronic products, achieving Electromagnetic compatibility (EMC) is the big issue. That is the main reason why we invest in EMC pre-compliance equipment. 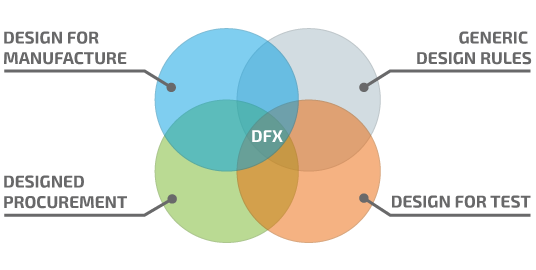 We apply the Design for Excellence (DFX) principles. This means your product will be designed by applicable PCB design standards (e.g. IPC-2221), it will be easy for manufacturing, testing and procurement of all components. 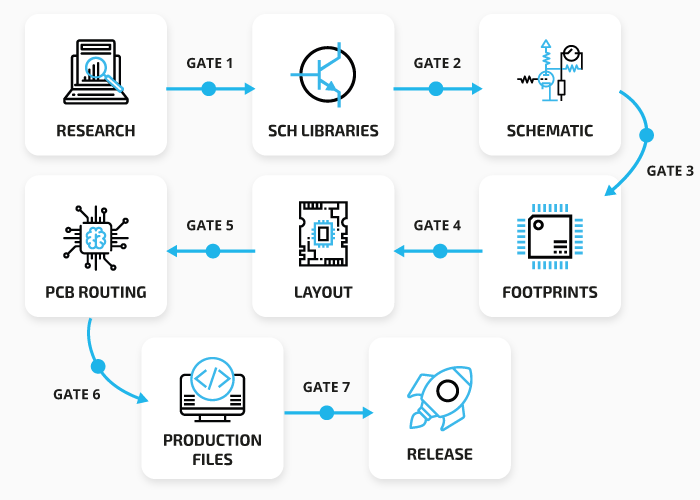 Our “7-Gates” design process ensures reduced number of design iterations and prototype re-spins, faster time to market and increased manufacturing yield. It is a product of our team’s collective experience transferred into standardized process with design checklists and gate design reviews. Digital control board, integrates PIC24F mcu, communication bus, digital I/O, transformer current monitoring chips, switching power supply. Industrial WiFi IoT gateway for collecting data from sensors. Sensor board: Air quality, temperature, humidity, noise level, and optional IR sensor for remote temperature measuring. High current heater control board. Sensor device that uses audio jack for power and communication. Measures temperature, humidity, air pressure and light intensity. Development board with motion sensor. Switching power supply, step-up convertor, RS485, relay output. Record player power supply. Filter circuit, universal battery charger (6V, 12V, 18V) controlled by 8-bit MCU, 2x16 LCD display, power supply output protection. Ethernet controller device, RS232 port, 4 digital inputs, 4 NPN outputs, step down converter. GSM controller and communicator device. 4 digital inputs, 4NPN outputs, RS 232 connection, step down convertor. GSM controller and communicator device. 4 digital inputs, 2 relay outputs, RS 232 connection, step down convertor, battery charger and backup circuit. Xbee wireless communication extension board for IOT. Audio recording device. SD card, ARM cortex M3, battery charger, high speed USB, 4 digital microphones, audio DSP chip. 6 layer PCB. Device for secured authentication via Bluetooth Low Energy or USB. Contains OLED display, BLE module, battery charger, PIC mcu with crypto-engine. Bluetooth Low Energy weather station. UV+Light sensor, RH+T, barometer. Li-Po Battery charger, BLE SoC. Portable, low power environmental sensor. Powered by Bluetooth Low Energy SoC, CO2 sensor, RH+T and pressure sensor. Contains Li-Po battery charger. Matrix led display panel for use in various products. Uses I2C communication protocol for connecting multiple displays. Based on STM32 mcu. Sensor board: CO2, NH3, temperature, humidity, with optional external temperature probe, RGB and LUX sensor. Industrial WiFi IoT gateway for collecting sensor data and sending it to the cloud via WiFi. Integrates Cortex M4 mcu, WiFi module, switching power supply, communication bus and digital I/O. GSM controller and communicator device. USB communication, 4 digital inputs, 2 relay outputs, battery charger and backup, temperature sensor, extension port. Audio digital to analog converter. 32bit mcu, high speed usb, audio DAC chip, digital signal multiplexer, analog stereo audio output, SPDIF, optical input. 6 layer mixed signal board. Audio recording device. 6 layer RIGID-FLEX PCB with 8GB flash storage, ARM cortex M7, battery charger, high speed USB, 6 digital microphones, audio DSP chip, Bluetooth classic and Bluetooth Low energy, 2 x external SRAM memory chip. ARS offers its clients a complete electronics design service, from idea and concept to fully functional prototype that integrates analog, digital and microprocessor electronics. Components selection and schematics capture, analog and digital electronics design, circuit simulation, PCB design, bill of materials.